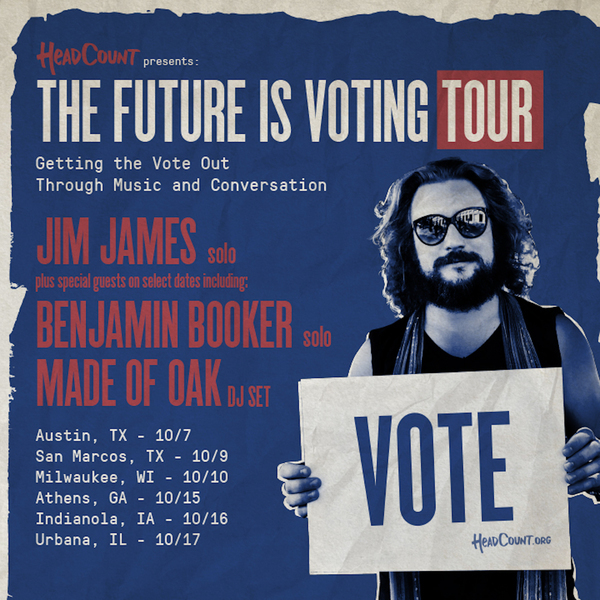 Jim James has announced "The Future Is Voting Tour," comprising six nonpartisan multi-artist shows in college towns in electoral "swing districts" that he instigated in order to promote voter participation. Set to begin with a celebratory late-night open-to-the-public event at Emo's in Austin, TX on October 7, the tour will feature Benjamin Booker, Made of Oak (Nick Sanborn of Sylvan Esso) and many others to be announced as the tour commences. Information on tickets for the Emo's event is available HERE. All the other dates will be free to students, and some will be streamed on YouTube. The complete dates are below. "The importance of getting involved at this moment in time cannot be overstated. This isn't only a Get Out The Vote concert," says James. "This is a learning moment aimed at college students to motivate them to vote, regardless of where they fall on the political spectrum. Each stop on the tour purposefully takes place in a contested electoral district or state for this important midterm election, where students and young voters have the ability to dramatically affect the outcome of this tremendous moment in history. Please join special surprise guests and myself at these events with the goal of truly inspiring thought, discourse and participation."